Housemarque is renowned for a couple of things: its consistently brilliant arcade titles with incredibly moreish gameplay, and its gloriously colourful visual effects. The Finnish developer’s body of work is a kaleidoscopic tour-de-force, the games as vibrant as they are deceptively deep. It should come as no surprise, then, that Alienation continues this trend – sumptuous shooting and colourful kabooms are its bread and butter – but it’s where it differs from its stablemates that ittruly impresses. 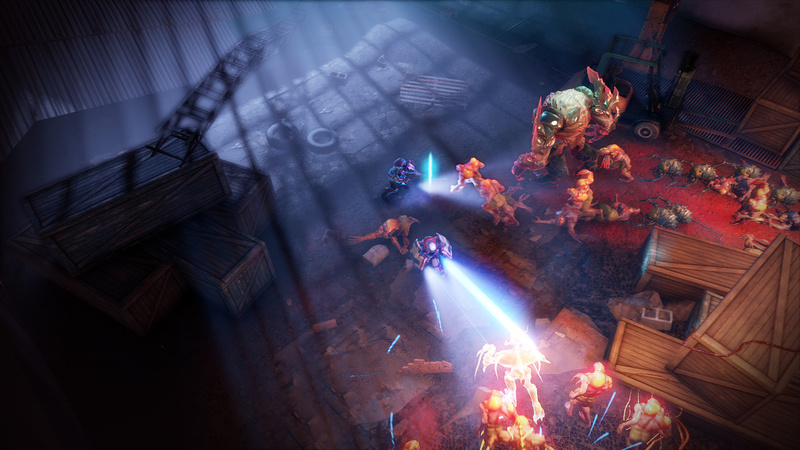 Granted, it does bear more than a passing resemblance to Dead Nation, but it’s clear from the off that Alienation is a far deeper and more expansive game than Housemarque’s zombie shooter. 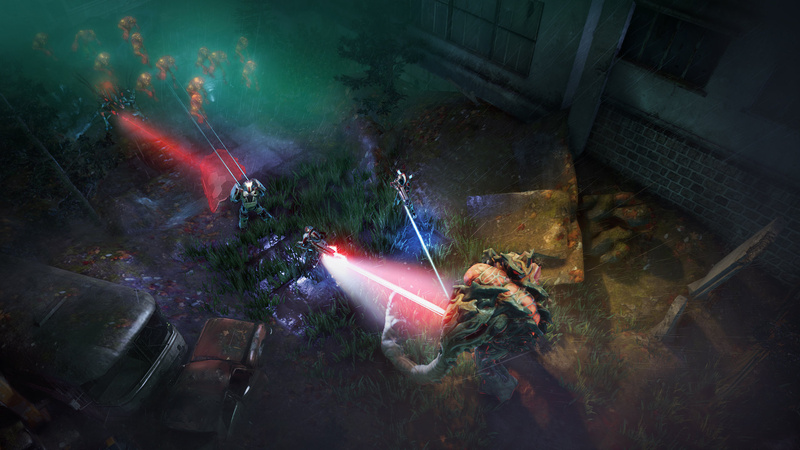 You begin by choosing one of three classes: the Tank is fairly self explanatory, with more HP and dealing the most damage on average; the Bio-Specialist is the healer class, and boasts some important technical abilities; and the Saboteur is the rogue, able to turn invisible and utilise a second melee attack. All three are well thought out and provide unique benefits to combat. Fortunately, they’re also all very fun to use, their unique skills all providing fulfilling tactical options. The moment-to-moment running and gunning, however, is the real star of the show. Shooting everything that moves (and some things that don’t) is sumptuously satisfying. The audiovisual feedback marries with the gameplay perfectly; heavy-sounding ammunition cuts through grunts like a hot knife through butter, blood soon decorating the ground in your wake. It’s a blessing that your arsenal is so effective, though, as it doesn’t take long before your screen is packed with enemies, explosions, and debris. It can occasionally get a little too hectic for its own good, but through clever use of your abilities, the chaos remains surprisingly manageable. But while the fundamental compulsive carnage is happening, there’s a lot going on besides simply blowing up aliens. 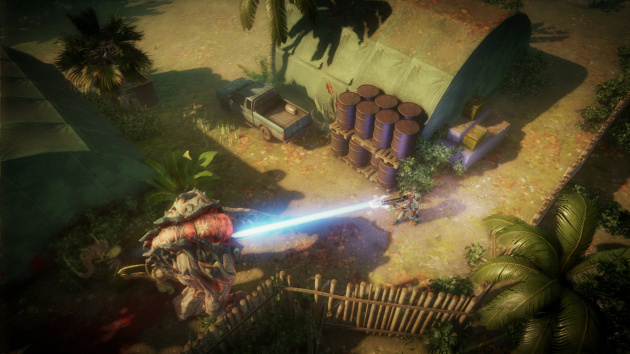 Optional random events, such as mini-bosses and challenges, are scattered across the environments. You earn XP as you progress to level up your character, each level earning you a point to spend on upgrading one of your active or passive skills. Furthermore, randomly generated weapons can be found in crates strewn around the sizeable levels, or are sometimes dropped by defeated enemies. These weapons each have a level, stats, and rarity, and some less common items can even be augmented with Cores that affect power, fire rate, and the like. Unwanted guns in your inventory can be salvaged, turning them into raw materials which are used as currency in order to re-roll a weapon’s stats. All of this works together to create an incredibly compulsive gameplay loop. The hours slip by as you complete missions, collect loot, upgrade your gear, and dive right back into the action, armed to the teeth with new toys and improved skills to play with. Thankfully, the enemies scale to your stats, meaning that the challenge never lets up. You can make things a little easier by selecting Rookie prior to diving into a mission, but doing this provides slimmer rewards, so there’s incentive to play on higher difficulties. 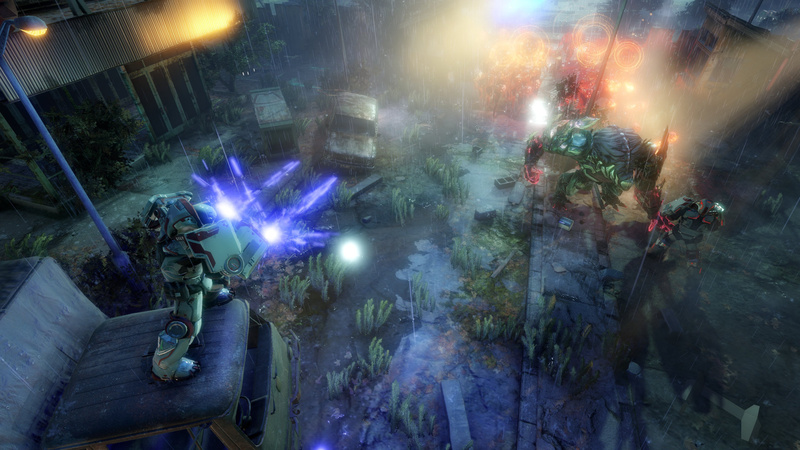 Another more challenging way to play Alienation is to play with others in four player drop-in/drop-out online co-op. Each character class truly comes into its own in this mode. Playing as the Bio-Specialist, we were able to make effective use of our party-healing ability to keep other players alive, while the Saboteur’s Artillery Strike is a powerful crowd-clearing manoeuvre that can quickly get everyone out of a hairy situation. The Tank’s Shield, meanwhile, provides each player with a forcefield that deflects enemy fire for a short time, a lifesaver when your squad is fighting off aliens from every angle. When everyone is working harmoniously, it’s an absolute blast, and while it’s completely viable to play Alienation alone, co-op is our preferred option. No matter how you decide to play, though, this is one meaty arcade shooter with plenty to offer, with new enemy types, weaponry, and gameplay mechanics being introduced even after you’ve finished the main campaign. Offline co-op would’ve been nice to have on release, but given how well-supported Resogun was post-launch, we’re confident that Housemarque has plans to build upon the very strong foundations that it’s laid out. 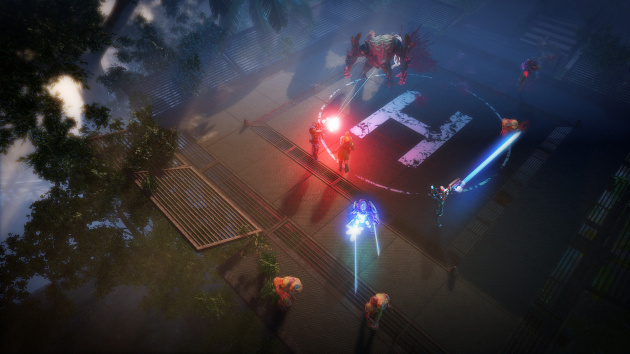 To describe Alienation as a spiritual successor to Dead Nation is a misnomer – this is a far bigger, deeper game, pulling in elements from RPGs and dungeon crawlers to great effect. The gorgeous visuals and addictive, tactile combat make this a feast for the eyes, with intense action never more than a few seconds away. Grabbing loot and fighting off aliens in co-op is stupendous fun, and the game opens up in meaningful ways the more that you play. If you’re looking for some high-octane, arcadey action with a fiendishly gripping gameplay loop, then this comes highly recommended.